In your time. At your pace. Sometimes it just feels lighter and easier to just go at your own pace, in your own time. Self led courses offer you the ease of diving in when you want to, and support through Facebook communities when you need it. Christina offers various courses for you and your children so that self development, inner knowledge, mindfulness and joy can be the foundation for your entire family. In a time when people are looking for ways to offer practical spirituality to their children, Christina Fletcher offers simple crafts, stories, poems as well as activities and worksheets for children aged 3-13 to give them tools for spiritual and emotional awareness and self knowledge. "I have done this course and it is packed full of useful, fun activities you can do with your children when the time is right. It's not just a 6 week course - you'll find yourself going back to it again and again. ​I can't recommend it enough." 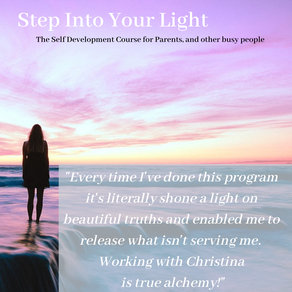 Step Into Your Light is a 4-week path to releasing guilt and what holds you back, aligning you to your true self within, so you can shine as Who You Really Are for your family and yourself. - You'll shift from overwhelmed and bogged down, to a place of relief, freedom, and alignment. - You'll learn concrete, practical tools to become centred within and present in your day. - You'll release the power of any negative mental chatter that passes on guilt and holds you back. - You'll develop practical spiritual tools to practice daily so your spiritual connection becomes a priority and resource for your parenting. - You'll remind yourself of dreams and fun as well as the freedom to play and have fun with your children. By the end of the course, you'll be feeling carefree and having fun, present and on purpose for your children each day as well as be able to have the sweet satisfaction of connection to your sense of divinity. Join the waiting list to be notified when this program becomes available again.